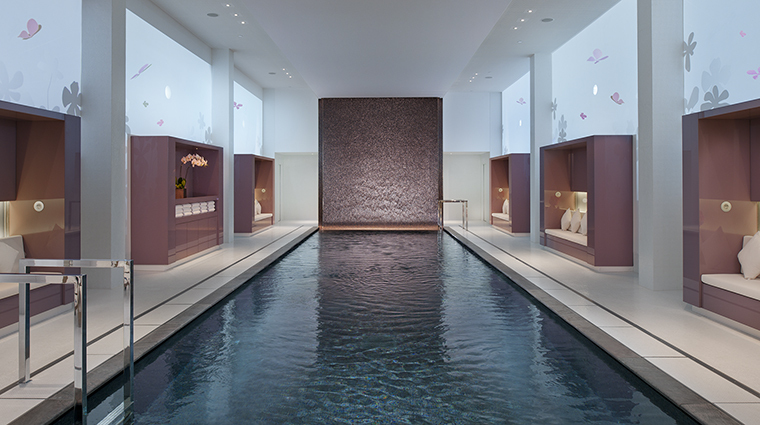 Descending the pristine white staircase into the subterranean Spa at Mandarin Oriental, Paris sets the tone for what’s to come — 9,700 square feet of Oriental-infused bliss. Countless white origami flowers cover the walls, while butterflies are dispersed throughout the white-and-plum-colored mosaic glass floor. 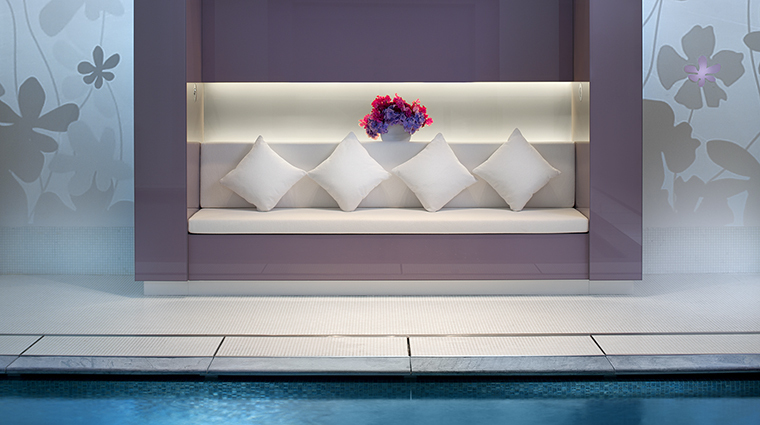 Lavender banquettes line the pool, with more flowers and butterflies projected on the surrounding white walls. In the treatment rooms, modern design and clean lines dominate, though silver and purple tones, wooden floors, soft lighting and luxurious fabrics create a sense of softness. • With a nod to the Orient, which includes determining your Chinese element, treatments combine ancient practices with modern techniques and products. • Body wraps, scrubs, as well as scalp and foot massages are the hallmarks of the spa’s three Journeys treatments. • The couples’ suites feature their own vitality pools, allowing companions to soak in peace. • We recommend attending the Zen and The City program. This holistic happy hour begins with a 30-minute private yoga class, followed by a 30-minute body or face massage. • Healthy snacks are prepared by Mandarin Oriental, Paris' executive chef Thierry Marx. • The water in the 46-foot-long pool is likened to swimming in Evian, but only hotel guests have the chance to experience it for themselves. 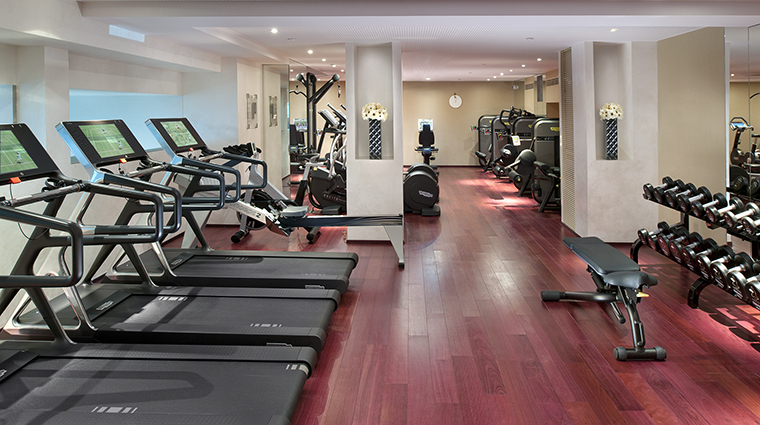 • Choose personal training sessions in the gym with Nicolas Véret to take your fitness goals to the next level or schedule time with Rebecca Leffler, the spa’s first wellness concierge. 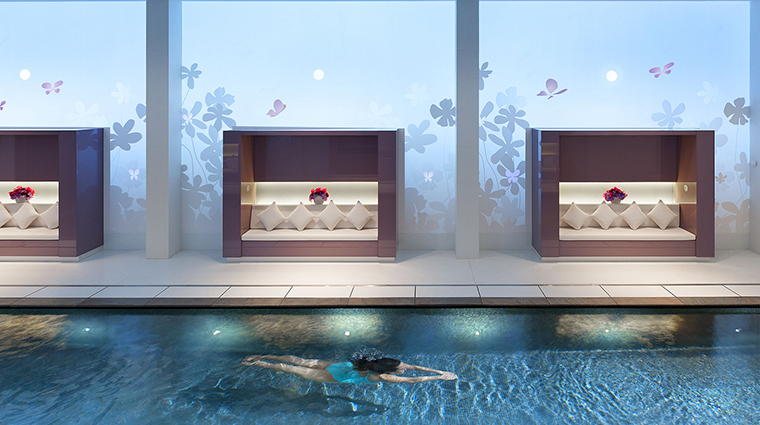 • Partnering with famous French brand Guerlain and the U.K.’s well-known Aromatherapy Associates, the spa fills its menu with exclusive facial and body treatments. • From head to toe, the massage offerings are designed to relieve what ails you, whether it be muscle tension, jet lag or stress using the fragrant quintessence oil made from ginger, frankincense and mandarin. • Choose from one of six signature services, including Time Rituals. Rather than specifying a therapy beforehand, your needs are evaluated and then tailor fit to the treatment. • Incorporating methods such as aromatherapy, acupuncture pressure, bamboo and tiger eye rollers, Journey treatments are unique among the city’s palace hotels. • Facials using Guerlain products range from 50 to 140 minutes, and are designed for radiance and anti-aging. • Add the Revitalizing Eye Treatment (a massage with herbal tea extracts aids circulation and drainage and reduces puffiness around your eyes) or Tian Quan therapy (a bathing ritual that eases stress, helps circulation and detoxifies) for even more pampering. 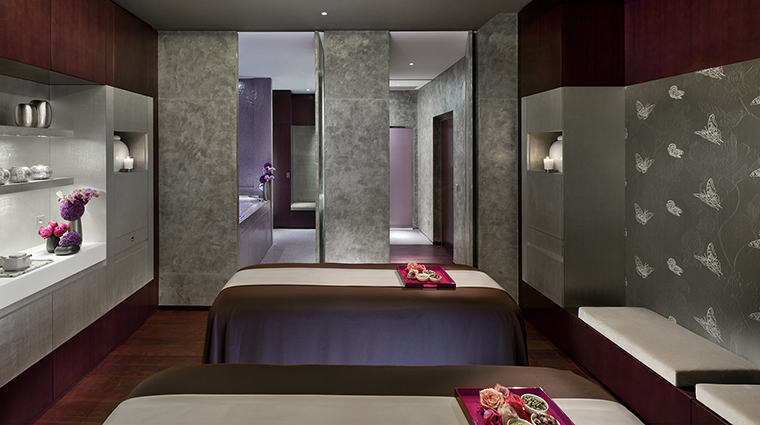 • The Place Vendôme spa has seven private spa suites, four of which are designed for couples. • Each of the suites is equipped with a private changing area, shower that doubles as a steam room, toilet and treatment room. • The gym is open 24 hours and offers a variety of workout options, including free weights, various cardio machines and a Kinesis system.